Dentists Only | Omaha, NE | William Kathrein, D.D.S. Drs. JoAnn and Bill will continue their 20 year tradition of offering you the following learning seminars. We ask that you pre-register for these sessions at least four months in advance. A. "Lunch and Learns" will be offered in your location or at our office. We can cover a variety of topics on restorative, cosmetic, and reconstructive dental cases. B. "Round Table" exchange study groups will continue once each quarter. C. Access to our teaching seminar web site will remain password protected and by invitation and subscription. D. In office "hands-on" classes will be limited to groups of four or less and offered bi-annually. A few times each year for our motorcycle riding colleagues we will offer guided motorcycle tour to different regions of the country (mostly to western states). Each day we usually cover between 250 and 300 miles of beautiful back country paved roads ( about 5-6 saddle hours each day), followed by leisurely dining and continuing education seminar in the late afternoon and also during evening dinner. This leaves plenty of time for local area exploring. JoAnn and I have spent 20 years touring over 200,000 miles and selecting the most beautiful and scenic roads, the most comfortable and delightful lodging, and have discovered some of the nation's most enjoyable and quaint lodging and dining places. Join us on a learning full week or just a few day rides in some of the most beautiful parts of the country. Dr. JoAnn taking a break in front of the general store in an old west town in southern Nevada. 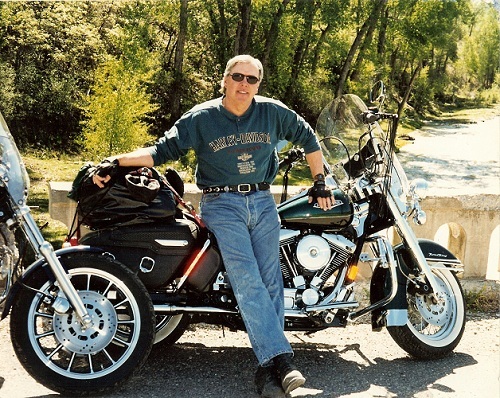 Dr. Bill with his Road King in western New Mexico. .
Dr. JoAnn with her Softail Deluxe on our way to El Paso, Texas. You will experience places you've only heard about. These photos are from recent tours through Idaho, Oregon, and Colorado. Beautiful wide open spaces like the famous Hwy 50 across Nevada.